Tall Poppies and fortepianist Geoffrey Lancaster continue to journey through Joseph Haydn's complete keyboard sonatas. Lancaster presented the complete cycle of 52 sonatas in concert in Melbourne, Perth and Canberra to mark the Haydn Bicentenary in 2009, and has been recording the works using period instruments from public and private Australian collections. He is currently Professor of the Western Australian Academy of Performing Arts, Edith Cowan University. Critically acclaimed as 'a genius of the fortepiano', Dr Lancaster is one of Australia's most distinguished keyboardists and was the first Australian to win a major international keyboard competition. His honours include the ARIA Best Classical Album, Gramophone Best Recording, the Sounds Australian Award, the Order of Australia, the Order of Arts and Letters, and ACT Australian of the Year. This series reveals the genius of Haydn. Lancaster plays with amiable virtuosity, embellishing as he goes, and finding all the latent humour and passion in these magnificent sonatas. His historically-informed performances bring clarity, originality, and insightful musical understanding to these works, the fortepianos responding with gusto to the drama and emotion in the music. All of the covers for this series feature paintings by Australia’s great painter, Fred Williams (with kind permission of Lyn Williams and the Estate of Fred Williams), giving this series a uniquely Australian flavour. Veteran Australian keyboardist Dr Geoffrey Lancaster has had a busy time of it in the recording studios recently. Not only is he continuing his survey of all of Joseph Haydn’s keyboard sonatas, using a variety of fortepianos from the ANU School of Music’s early instruments collection — Vol 4 is out now — but he has also recorded a witty and charming trio of Mozart piano sonatas, including the A major K331 famous for its Rondo alla Turca. And on top of that comes a beautiful version of Haydn’s the Seven Last Words of Christ, more often heard in string quartet or full orchestral form. The composer fully approved of the keyboard version and, despite some nagging doubts before putting this on my CD player, I can confirm that with Lancaster’s masterly command of articulation, expression and dynamic, the composer was right. Far from fears that a mere fortepiano would lack the dramatic depth for this long and extraordinary deeply felt composition, Lancaster imbues it with great spirituality and compelling beauty of line. At 75 minutes long and comprising nine slow movements (an introduction and turbulent postlude with seven sonatas representing the seven utterances of Christ from the cross), the listener’s attention and appreciation never wavers. It’s a remarkable achievement. 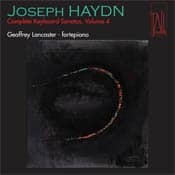 The fourth volume of Lancaster’s new recording of the Haydn cycle — he recorded some of them for ABC Classics but the Tall Poppies set is far superior — features the final three works. It’s generally accepted that Haydn composed 55 sonatas, but because when they were categorised there were several doubtfully attributed to him we get Nos 60, 61 and 62 on this disc. Composed in 1794 they are full of the composer’s trademark wit and, like his mature string quartets, they display a considerable range of emotions and moods. As is his custom Lancaster eases the listener into each work with a brief improvised prelude in the same key as the work that follows. He adopts the same approach for the Mozart, an album which marks Lancaster’s return to the composer for Tall Poppies after 26 years. He recorded Unexpurgated Mozart with the Song Company in 1991. The Mozart set is a delight from start to finish and Lancaster is not averse to having some fun, especially with the Rondo where he uses rubato liberally and even improvises a mini-cadenza, something that the composer was known to do on occasions. Lancaster performs on a fortepiano based on an 1805 Anton Walter & Sohn — Mozart owned one of his instruments — which was built by Peter McNulty in 2011. Its sound is surprisingly full, once your ear adjusts from Steinway mode. The album covers feature Australian artists. Fred Williams for the Haydn sonatas, Roy de Maistre for the Seven Last Words and Polish artist Gosia Wlodarczak, a friend of Lancaster who used to live in Perth, for the Mozart.